PETER VAN DE WIJNGAART, FLOOR KASPARS, ROBERT WILLIAMS, BERNIE LAWITZ, AND HIS DAUGHTER HANNAH LAWITZ at the Silk Road Gem & Jewelry Show off of Grant Road, in the former Grant Inn, now the Grand Luxe Hotel and Resort. Van de Wijngaart and Kaspars are Dutch bead lovers who visit Tucson every year. Lawitz is the former owner of recently closed Beads Galore. Photographs by Robert K. Liu and Patrick R. Benesh-Liu. There is a thrill to treasure-hunting that transcends the humdrum routine of everyday life. It is the feeling that comes from encountering the unknown, and even more alluringly, the ability to somehow take that home with you. There exists a place where that is possible. It is called the Tucson Gem & Mineral Show, which is somewhat of a misnomer in that instead of being one, singular show, it is more like if one occupied a small city with tents, pop-up tables, booths, and mini-vans. During the months of January and February, Tucson undergoes just such a transformation. Roughly fifty shows, fairs and festivals spring up around the city, some featuring just a dozen exhibitors, others hosting hundreds of vendors. It is not just gems and minerals that are for sale. Tribal and ethnographic art, ancient artifacts, crafting tools and supplies, hand-blown glass beads, jewelry, clothing, baskets, purses, backpacks, fossils, giant sculptures—it really is easier to list what you will not find at the Tucson Shows. Which is to say you can find almost everything there. Patrick R. Benesh-Liu is Associate Editor of Ornament and continues to find time to enjoy craft in between writing, travel and tech support. This January he and Robert travel to Tucson to visit the Gem & Mineral Show, where they will see old friends, make new ones, and cover all the wonders of that worldly bazaar. In this issue he describes one small corner of the vast market, and encourages readers to indulge in their inner explorer and visit the show themselves. 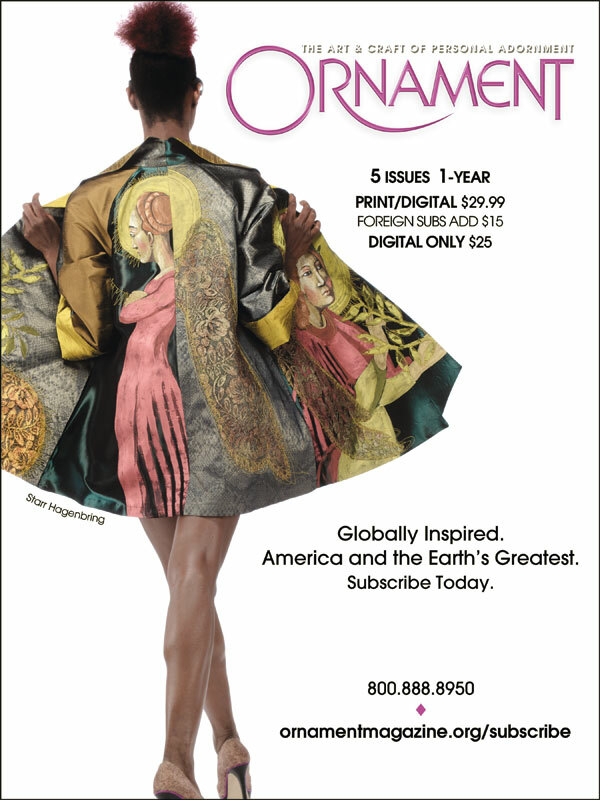 As Ornament’s reporter, he also provides a zesty compilation of the latest news in craft, where you can find out what is happening with art to wear in the global neighborhood. GUESTS OF WALKER QIN at the Azian Restaurant, mainly vendors from The Ethnographic Group at the Grand Luxe Hotel: Chaouki Daou (from Lebanon), Patrick R. Benesh-Liu, David and Marilyn Ebbinghouse, Bassem Elias, Thomas Stricker, Walker Qin (from Beijing), Jamey Allen, Robert K. Liu, and Lise Mousel. Photographs by Robert K. Liu and Patrick R. Benesh-Liu/Ornament except this image. Downturns in global economies and the aging of collectors have seriously impacted the Tucson gem shows, especially for those dealing primarily in ancient and ethnographic ornaments. There has always been a certain amount of selling by visitors, which has probably increased, along with the disposal of collections by owners who have left the marketplace or died. Given the decreasing number of collectors and the changing demographics of buyers, the market for ancient and ethnographic jewelry is in considerable flux. VISITORS AND VENDOR AT THE BALLROOM: Peter van der Wijngaart and Floor Kaspers (from Holland), vendor Thomas Stricker of TASART, Karen King and Kate Fowle Meleney, well-known American glass artist. The market for certain types of beads has shifted to China. Beads of natural materials that can be worn, such as amber, coral, stones, especially those with some relationship to Tibetan Buddhism, are sought after—none more than patterned stones such as dZi, other etched agates and pumtek. With etched agates and pumtek, there has been market manipulation with books containing information which may not be historically accurate. The Pyu culture of Burma may be the next to see such treatment (Qin, pers. comm.). Due to the savviness of many dealers, Africans and others have brought these desired ornaments to China, and many have turned their attention to this potentially lucrative market, especially if the Chinese begin to expand the number of collectors and their currently relatively restricted interests are broadened. The Tucson Gem & Mineral Show (its popular moniker) is somewhat of a misnomer. It is better to think of the event as an umbrella, under which flourishes dozens of markets and fairs with different specialties. Some are purely for gem and stone buyers, including high-end vendors who target only the richest clients. Others have nothing to do with gems and minerals but sell tribal and ethnographic art, ancient beads and artifacts. Some shows focus on contemporary makers, with vendors selling supplies, tools, beads, and handmade jewelry to hobbyists and fashionistas seeking a little something special for their wardrobe, along with craft workshops catering to popular media like polymer, glass, metal, and beads. DANNY LOPACKI AND ART SEYMOUR, good friends and respectively noted stone carver and chevron glass bead artist. Lopacki’s booth shows both of their work, as well as other beads. In the Grand Luxe Hotel ballroom during 2015, as part of the Gem and Jewelry Show on Grant, six vendors made up The Ethnographic Group, including The Lindstrom Collection (Lise Mousel/Jamey Allen), David Ebbinghouse Fine Jewelry, Ancient Beads and Artifacts (Bassem Elias), Tasart LLC (Thomas Stricker), YoneSF (Sandra Fish), and the Indra Collection. Already known for the breadth and excellence of their offerings, the Lindstrom and Ebbinghouse booths added fine assembled jewelry from decades of collecting. This one room now shows ancient and ethnographic jewelry that is world class, a category that could be called hidden treasures. These are cultural goods of quality and rarity, deserving of serious study and efforts at preservation, but now are being or will be dispersed due to the passing of their owners or lack of institutions for housing and display. Also showing at the Grand Luxe was the work of many interesting dealers, like Pacific Artefacts, and including contemporary glass artist Art Seymour and stone carver Danny Lopacki. PAULA RADKE ART GLASS AT THE RADISSON. She has long been associated with dichroic glass and is the developer of Art Glass Clay, a revolutionary way of making glass ornaments without the need of a torch. To Bead True Blue and the Tucson Bead Show takes place at the Doubletree Reid Park and Radisson Suites Tucson, with the latter in the eastern outskirts of the city. Both shows are run under the auspices of Anna Johnson and her family, and host a wonderful mosaic of tool and supply vendors, ethnographic dealers, gem, mineral, and bead sellers, handmade glass bead artists, polymer artists like Klew, Christi Friesen and Yellow House Designs, and many workshops, like those by Kieu Pham Gray of Urban Beader and Paula Radke. During our visit, Radke demonstrated her Art Clay Glass, which can be fired in a microwave oven if placed in a ceramic fiber container, to enable a high heat buildup. Doug Baldwin taught photography; he has had many pupils in three and a half years. Workshops for popular media have been one of the fastest-growing areas of craft and vendor shows in the past decade, with To Bead True Blue and the Tucson Bead Show being no exception. MIKA NISHIYAMA OF JAPAN, among a group of skilled Japanese glass beadmakers at the Tucson Glass Art and Bead Festival. The Tucson Glass Art and Bead Festival had its first year in 2015, organized by Doug Harroun of Greymatter Glass. Those in the know are aware that the Festival basically picks up the reigns from noted boro artist and early bead show entrepreneur Lewis Wilson’s groundwork. Held now at the Sonoran Glass School, the show’s goal is to provide a marketplace for handmade glass artists in Tucson, and a number of bead artists signed onto the endeavor, including Bronwen Heilman, JC Herrell, Terri Caspary Schmidt, Patty Lakinsmith, and Donna Conklin. A group from Japan, spearheaded by Akihiro Okama and composed of glass bead and marble artists such as Takahiro Muto, an excellent crafter of fine borosilicate beads, and talented young artist Mika Nishiyama, was a welcome presence. The Sonoran Glass School was also the venue for the Flame Off, a live competition for glass artists; exciting and fun to watch, augmented by good food and drink from food trucks on their grounds. Wilson was one such participant in the contest. 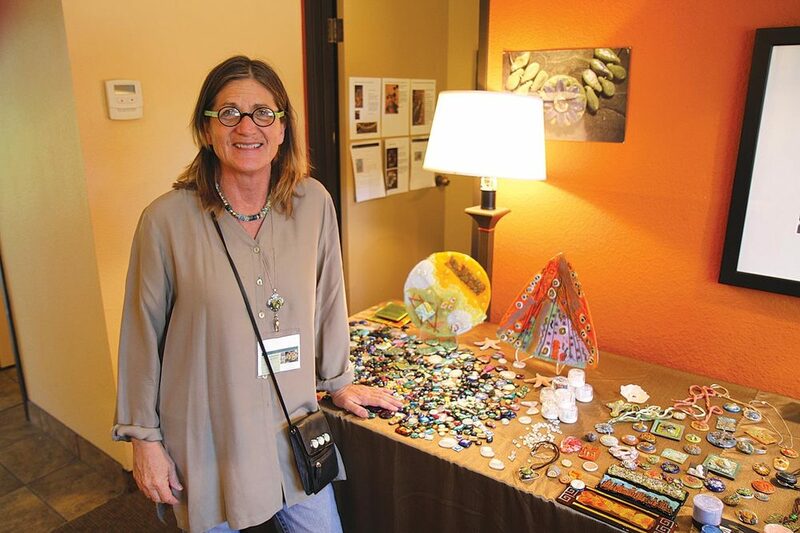 The Festival was also home to the Linda Sweeney Collection, an ambitious effort to create a contemporary glass bead museum based in Glorieta, New Mexico. Sweeney herself was present with several cases of the collection, which presented rather delightful examples from across the spectrum of contemporary bead designers. Being in Tucson during the Gem & Mineral Show is like being in a city-wide carnival. One may see everything from treasures to trash, although one person’s trash may be another person’s treasure. If you have never visited, you owe it to yourself once in your life to attend this vast spectacle. Robert K. Liu is Coeditor of Ornament and for many years its in-house photographer. His new book, The Photography of Personal Adornment, covers forty plus years of shooting jewelry, clothing and events related to wearable art, both in and out of the Ornament studio. In this issue he writes about the extraordinary crafting of Zhou Dynasty/Warring States faience, glass and other silicate ornaments, as well as their complexity. He and Patrick Benesh-Liu also cover the lively spectacle of the Tucson Gem Shows.